Everyone’s just a little more giving and generous during the holiday. 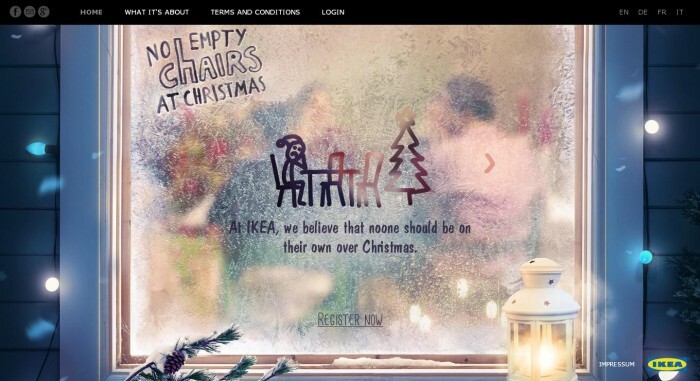 In an effort to spread the warmth and fuzzies for Christmas, IKEA has launched a platform dedicated to people that are due to spend the day alone. A dedicated microsite No Empty Chairs at Christmas encourages people to reach out – whether they are single and living abroad or a family with open seats to spare – to join in on a Christmas celebration that will be remembered for years to come. The match-up is to take place 24-26 of December, with registration as hosts ending on the last day of the initiative. Basic information from both guests and hosts are required, with the options to upload photos and tell either party a little bit more about themselves. Language preference, family size and location are mandated by the service as part of the basic criteria for effective match up. There is mention of participating countries. BBDO, Zurich Switzerland was the advertising agency responsible for the site. The move comes as IHG plans to grow Regent portfolio from six hotels today to more than 40 hotels located in global “gateway citie..
David Kiu will be leading internal communications and engagement at Mars Chocolate. ..